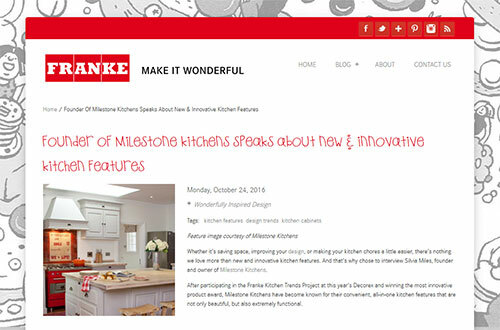 "I have 3 words for Milestone Kitchens. 'Quality. Integrity. Affordability.' 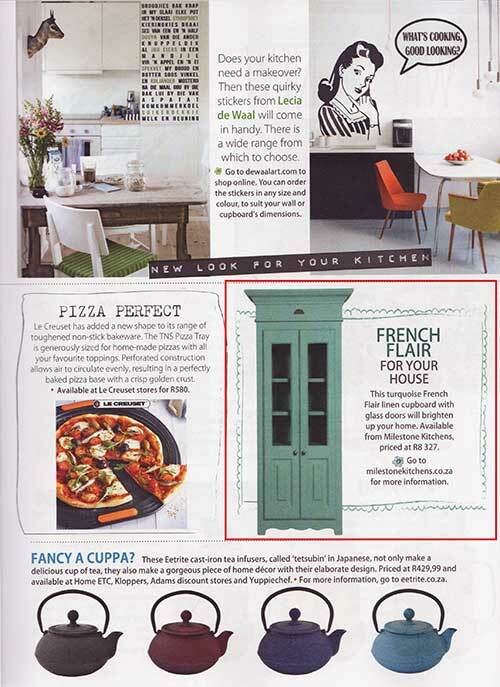 Well done"
The French Flair Kitchen in a Cupboard in the October issue of Home | Tuis magazine. 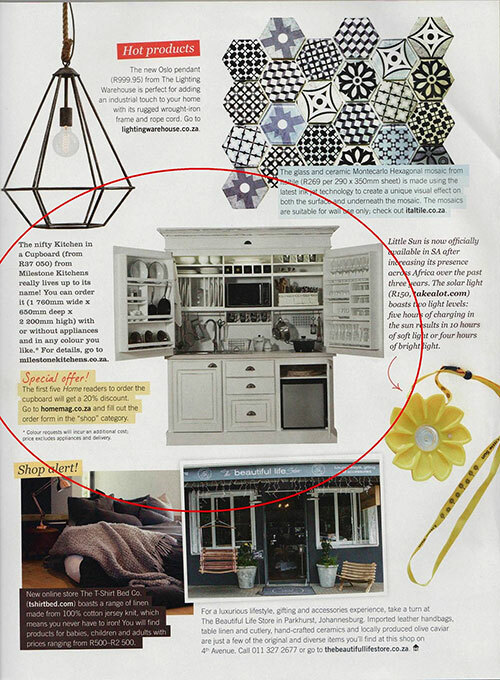 The Milestone Kitchen in a Cupboard featured on Kyk Net's 'n ster vir my bed. Not only are we always right on trend and taking over the world, we can see 20 years into the future. We are EVERYWHERE. Our plan to take over the world is working! A perfect floor plan. We love this. So easy to work with for both us and the client. 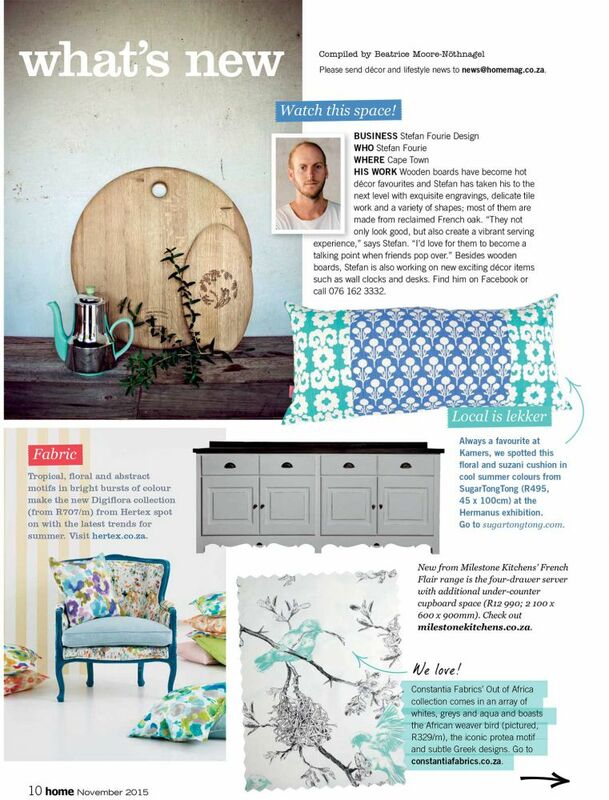 Don't miss our double page promo in Home | Tuis magazine in the November issue. 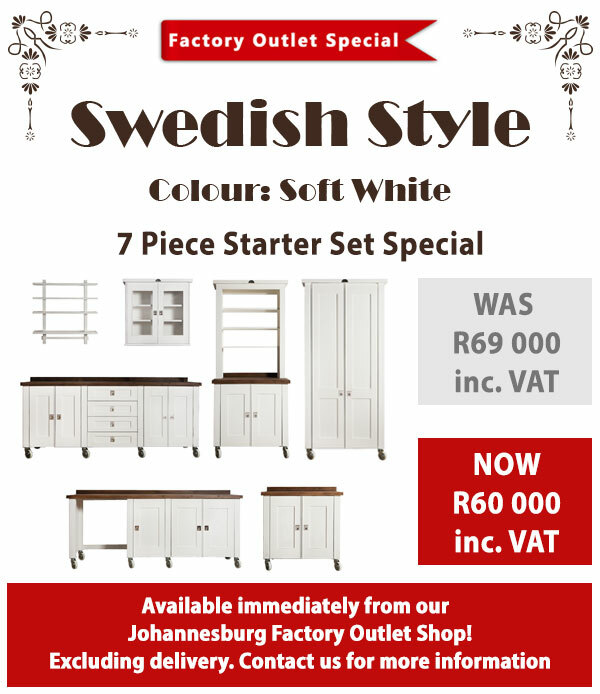 Stand a chance to win kitchen units of your choice to the value of R50 000. See competition for details. 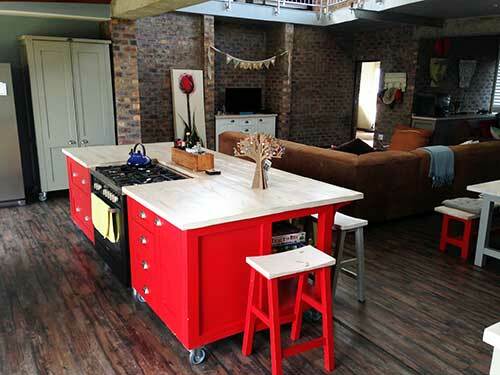 We really love this unit, designed by Richard from Knysna for his African Allure Kitchen. 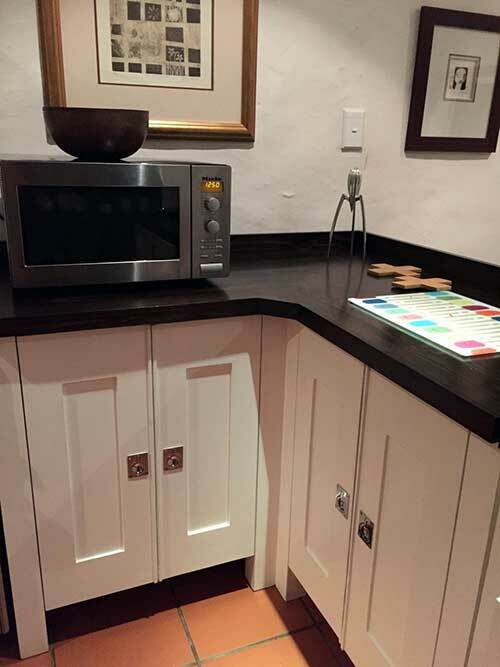 Custom made AA unit with wine rack and drawers to make space for a pillar in the kitchen. Yeah sure, we can definitely 提供中文业务与服务的可能性 and recommend that you 聯繫我們獲取更多信息. You win some, you lose some. We can only be grateful for friends like Engela. Thank you Franke for this really chic blog you did with us. You have been amazing to work with and we look forward to many more years with you. Great for small spaces! Milestone Kitchens can be used for modest furnishings in limited areas. 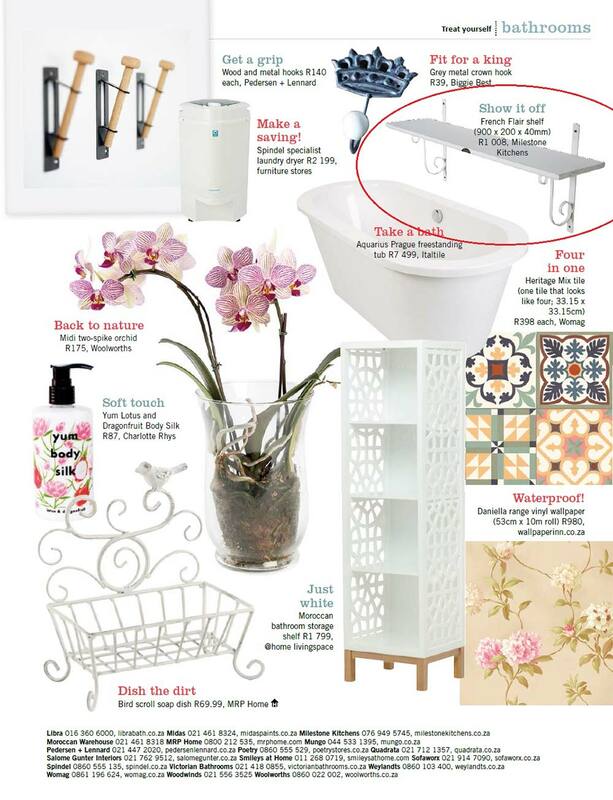 Check us out on DesignMind page for a little more inspiration on furnishing small spaces. We don't often get asked to have the African Allure range in white. For our clients considering it, this is the result. It is a very different but beautiful finish. 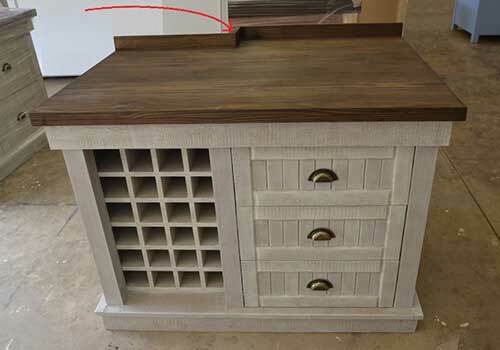 A break down of the side view of our standard Centre Island. Often, a diagram like this helps our clients visualise what they have ordered. 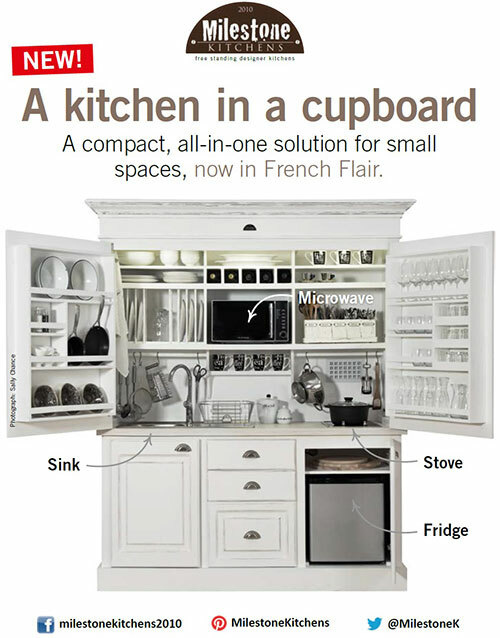 Our innovative Kitchen in a Cupboard is the perfect all in one solution, and now you can use it to add some French Flair to your kitchen. 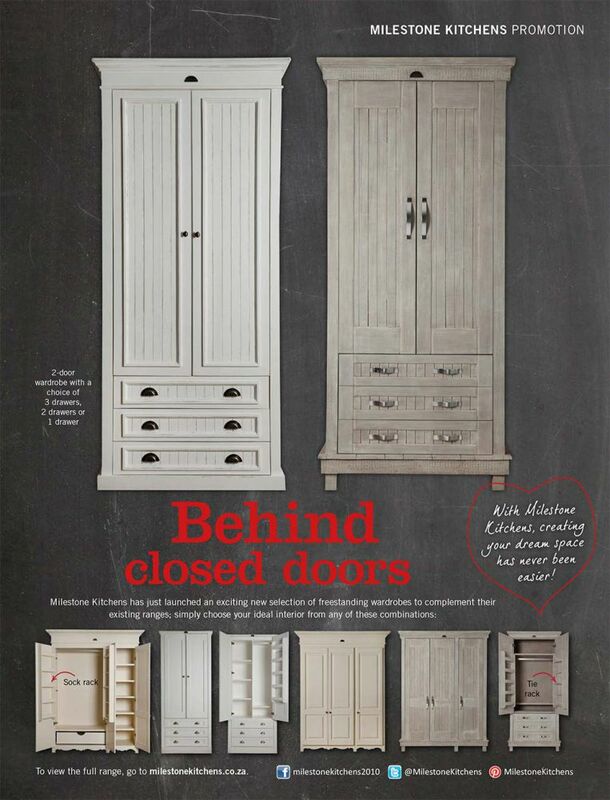 Order your Kitchen in a Cupboard in our French Flair style here. This is our KIAC in Scandinavian Sky 8445-1 with a 13mm Caesar Stone Top. "Sylvia, I'm not ashamed to say I was actually brought to tears when I saw your email. I can tell you have your customers' best interest at heart. Thank you so, so much. Its been a year of trying to get things together to fix up our house and you are the first supplier that has done something like this, what a breath of fresh air. Now we can finally have the kitchen we want! I will wait for the transport quote and we can then start the ball rolling. Yayyyy. It is so lovely to be able to make somebody happy. All we did was give her a discount. Ahhhhh man! We love this email from Johanette, especially the last sentence. Johanette came to see us at Decorex, Jo'burg and we discussed her kitchen. She also scored a factory second Pastry Table. I enjoyed talking to you and I felt you really understood what I wanted. Short and sweet and to the point. We love it when our clients make the effort to give us lovely compliments. This is one of our most popular colours. It is chosen by our clients time and time again. It is Dulux Dusted Moss 1. Milestone Factory showing completed African Allure units and Swedish Style units under construction. We have successfully shipped to Monaco, Uganda and other countries in Southern Africa. And now maybe the Seychelles. 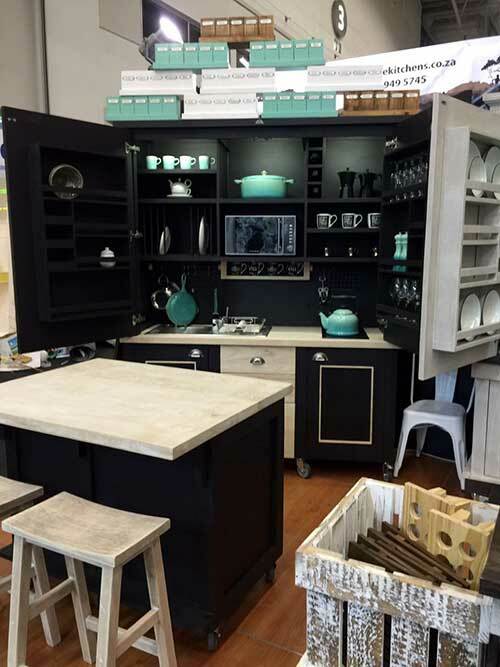 So don’t hesitate to ask for your kitchen to be shipped absolutely anywhere in the whole wide world. Yesterday was PA Day which I didn’t actually know about because my PA didn’t tell me it was. I thought PAs were supposed to remind their bosses about important days. Plus, she posts stuff on social media about me, probably done during working hours, but thats ok because it says some quite nice things. Despite the fact she has a migraine and I tell her to take it easy, she does her work. My point is, I don’t think that I actually AM The Boss as you can see by the letter below that she wrote to me a few days ago. I understand you would like to keep your finger on the pulse in your absence, but as your PA, emails from you panicking half way across the world makes my job difficult. I have things under control. 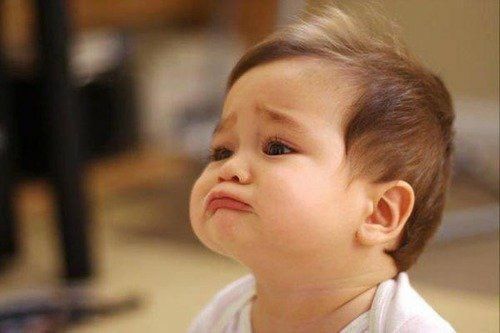 It will be ok. You can leave these things to me, put your iPad down and focus on what YOU have to do. I promise…PROMISE… I will make contact with you if a crisis (unlikely) arises and I need to draw from your wisdom. The outstanding But 10 is for Monica. I have one But 10 Sink in stock for Patricia that we can use. It will be ok.
A useful tip about Centre Islands. 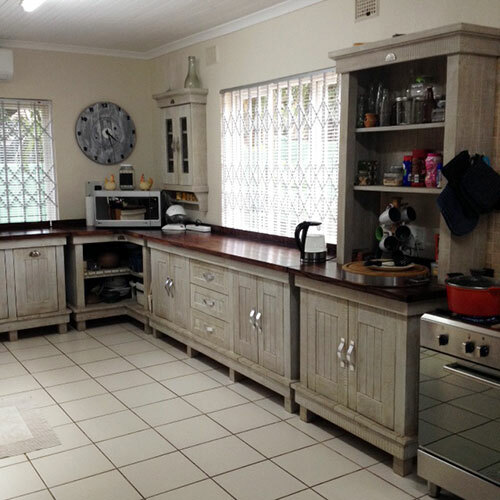 When it comes to kitchen islands, we generally think of additional storage, preparation and serving space in the kitchen. But the fact of the matter is that kitchen islands can waste a lot space. Choosing the wrong island or placing it in the wrong spot can be a mistake. 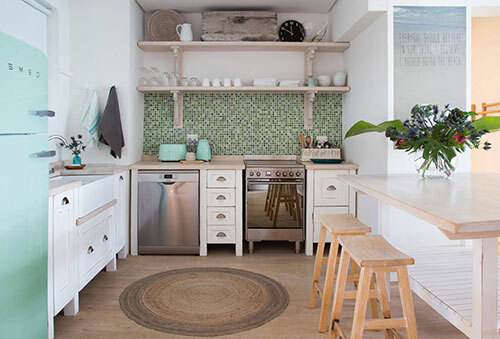 Islands that obstruct the flow of traffic to and from the sink, fridge, stove and other workstations will create bottlenecks. An island should have enough room for people to move and work around it. 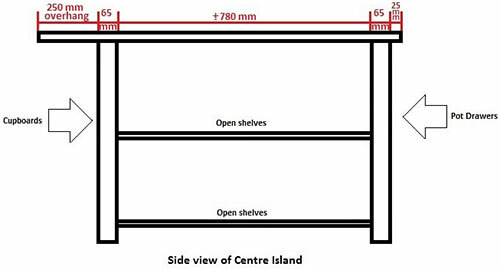 Experts say that unless the kitchen is at least 2400mm deep and more than 3600mm long, one shouldn’t even consider an island. 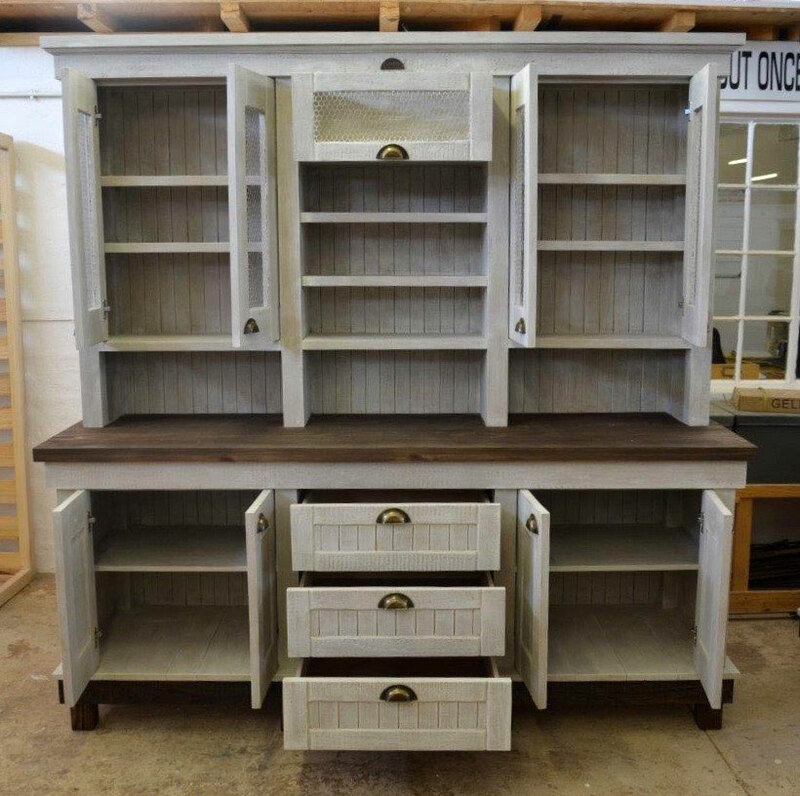 We have a range of islands available depending on the size of your kitchen and if we don’t have the size you need we can custom make one for you. The magnificent Swedish Style island in Mexican red below is 3000mm x 1400mm. Our new French Flair 4 Drawer and 4 Door Unit was showcased in the November edition of HOME/TUIS. 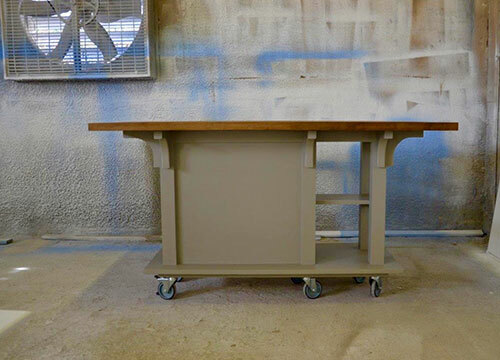 Oh how we love this colour chosen by Joy Denton in Sandton for her SS units. (Plascon Distant Storm G7/E1/3). The rest of the unit will have a drop in sink in Caesarstone. Here is a useful tip on sealing your Milestone Kitchen tops. The server is perfect. Everyone that sees it makes a comment. I have sealed it with Timbercare as I said, and this I will do this once a year. It is actually a exterior sealer for outside furniture and wooden decks, and I have used it on my siligna patio furniture with great results. I am so chuffed with this piece of furniture! 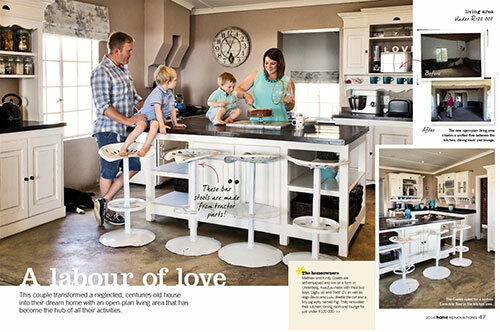 Dalene Jansen van Rensburg, Mpumalanga"
Franke was fantastic to work with and I am certainly a fan myself. 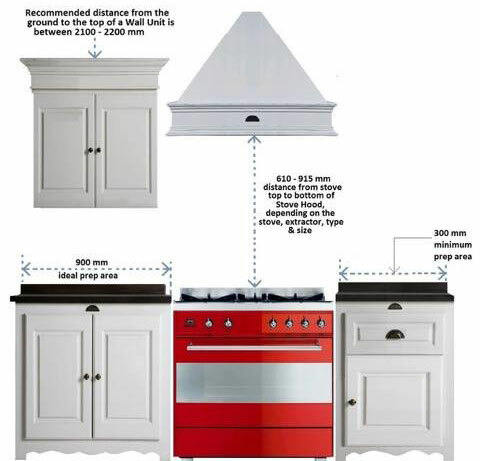 Here are some recommendations if you're confused about where you should place your free standing kitchen units. Wow! Tannie Botha. We love Wayde's coach. Such a shining example to us all that she is so passionate about her job and obviously living life to the full at the age of 74. Feeling so proud today! 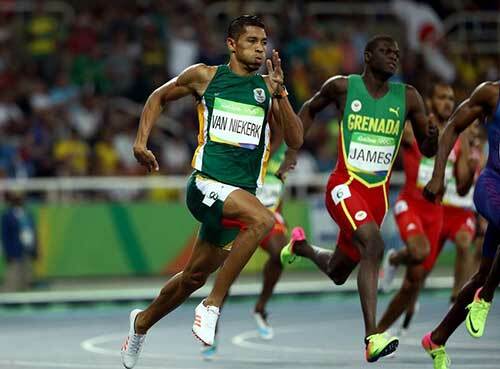 Wayde Van Niekerk smashed Michael Johnson's 1999 400 m record, setting a new world record of 43.03 seconds. We don’t care for gold when our blood is gold! 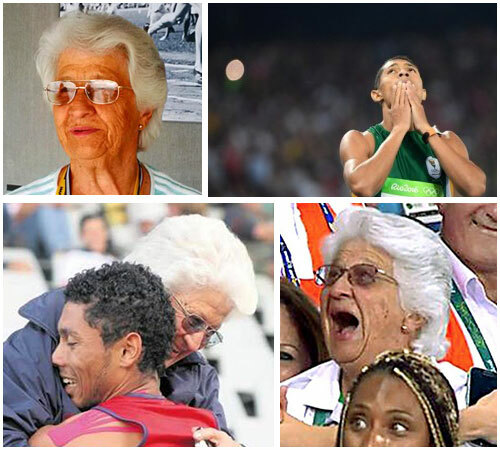 We adore the attitude of our sports men and women at the Rio 2016 Olympics. Here’s just another reason why we are proudly South African. 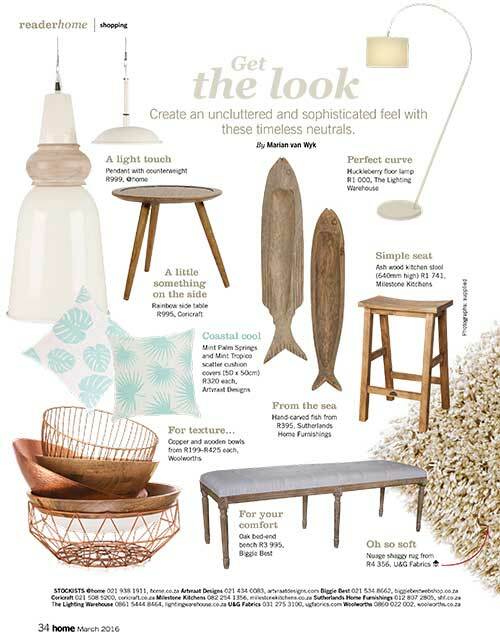 Decorex Johannesburg was a great success. We completely sold out. 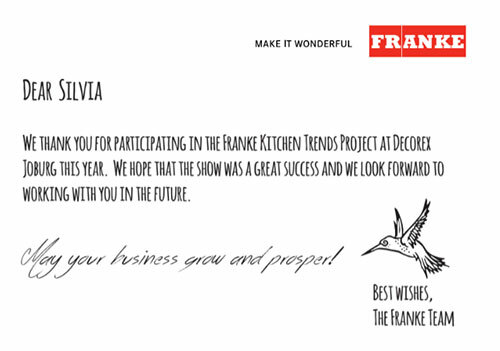 A MASSIVE thank you to Franke SA for their sponsorship for our Decorex shows this year. We greatly appreciate their continued support. We wouldn't be where we are without them. 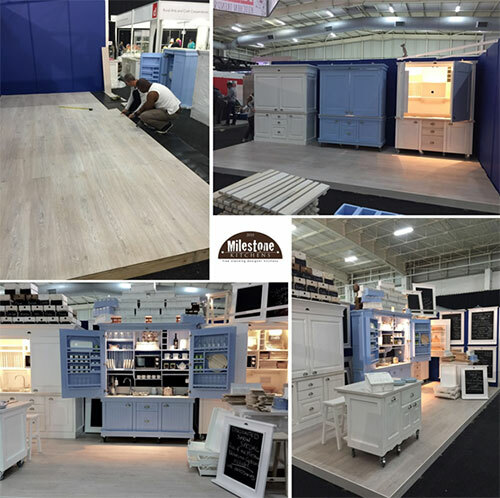 Build up for the Decorex Johannesburg 2016 exhibition. By 18h00 pm on Thursday 4th of August we were ready to rock. 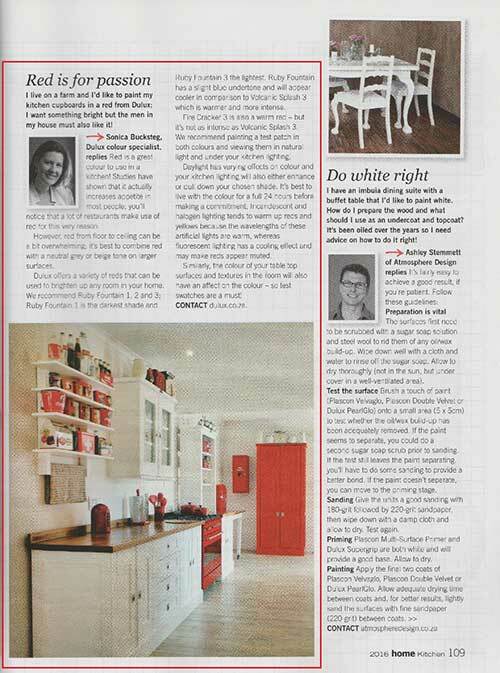 Only one more day at Decorex Johannesburg, come and look at our award winning Kitchen in a Cupboard. Take the opportunity to see our product and buy 'smalls' not usually available to the public. 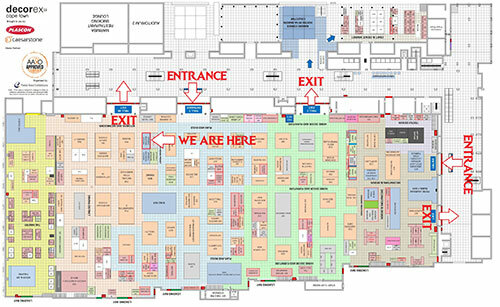 We look forward to meeting you at the stand. 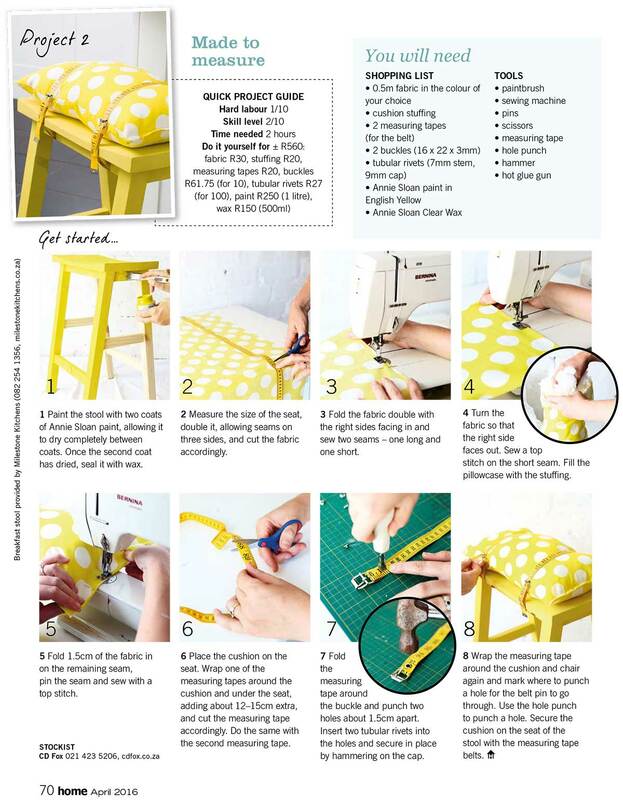 HOME/TUIS Magazine has used our pine bar stool in their DIY section and it looks so pretty in yellow. Go to our Facebook page and tell us what colour you would paint your bar stool? So this is the stool we were talking about, the bar stool in pine instead of ash. 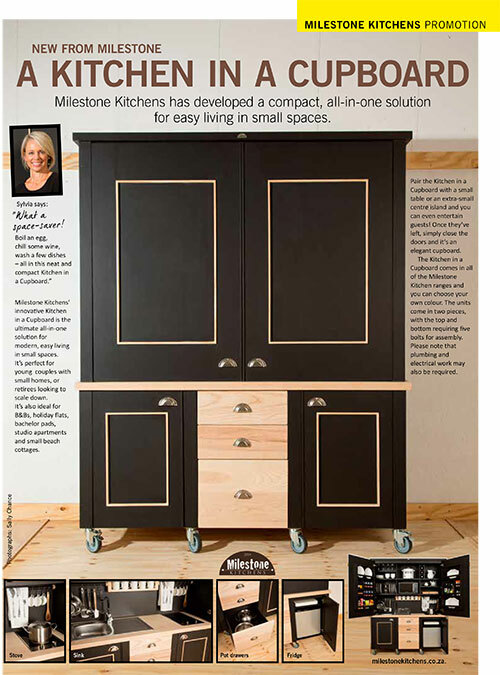 This is Milestone Kitchens' "Ash Stool". It is made from solid ash and is one of our best sellers. 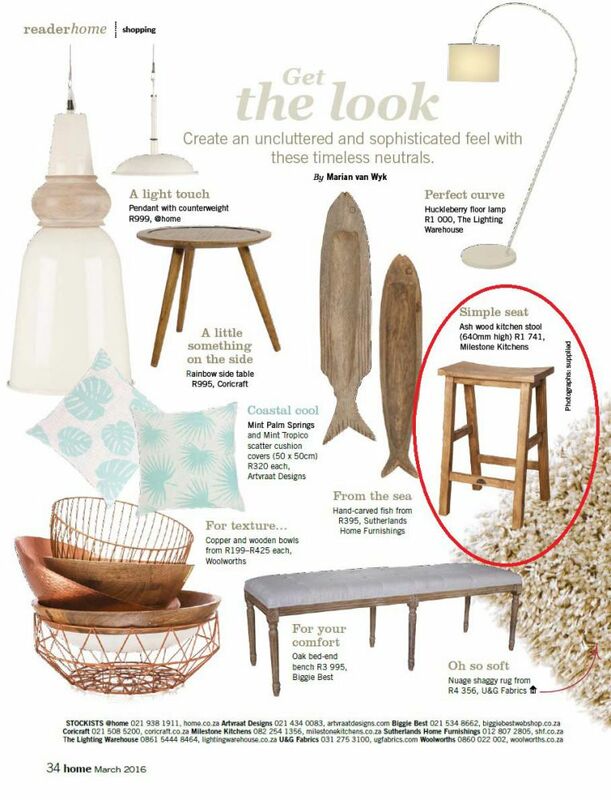 The stool can be ordered stained or raw or in pine and any colour. 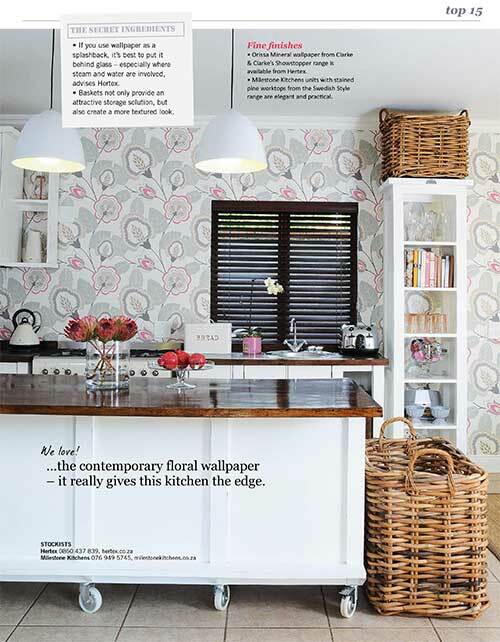 Milestone Kitchens features in the current HOME/TUIS Paint Magazine. 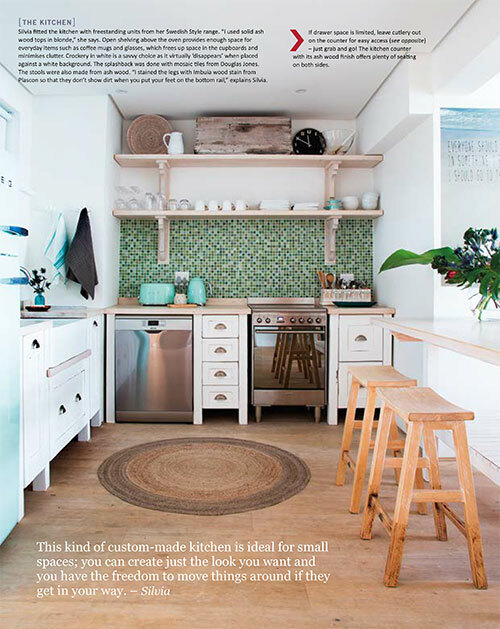 So you like the "limewashed" floor effect? DIY with some advice from yours truly. The Swedish Style Milestone Kitchen features as one of the top 15 kitchens most loved by HOME/TUIS readers. 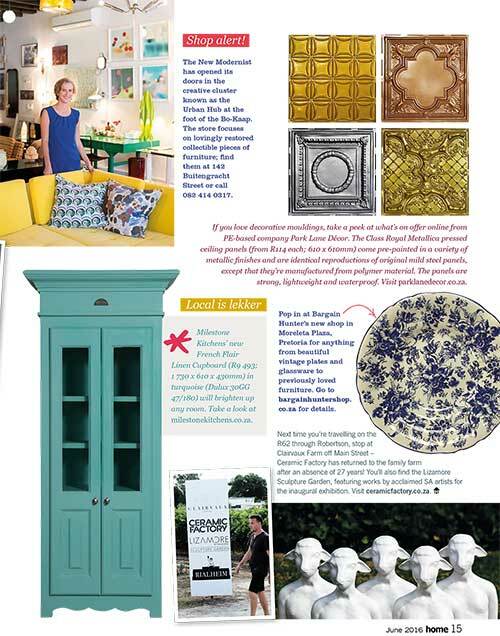 Milestone Kitchens French Flair linen cupboard features in the latest Ideas magazine as a way to add spice to one's kitchen. The French Flair shelf can be incorporated into any room in the home, not just the kitchen! Our clients buy from us again and again. You can’t get a better compliment than that! 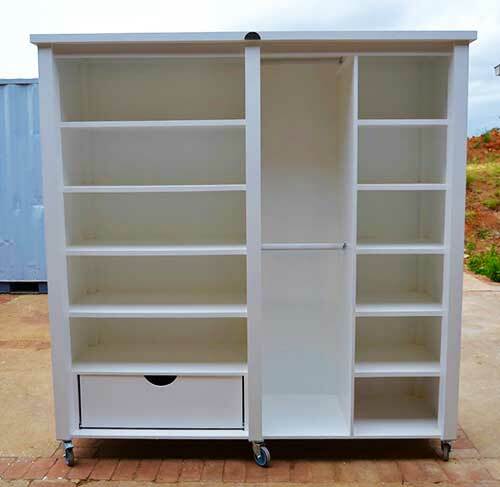 Don't forget that we make wardrobes too. Freestanding ones in all of our ranges and you can custom make them to fit any dimensions and interior configuration that you require. 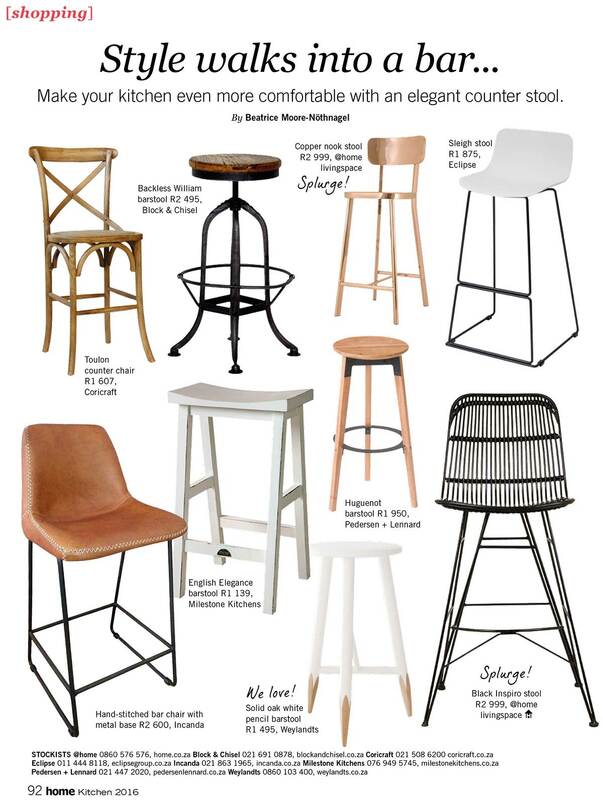 Milestone stools are available in both kitchen stool height 630mm and bar stool height (750mm). See our Pinterest information on this https://za.pinterest.com/pin/518899188290108416/ for more detail. 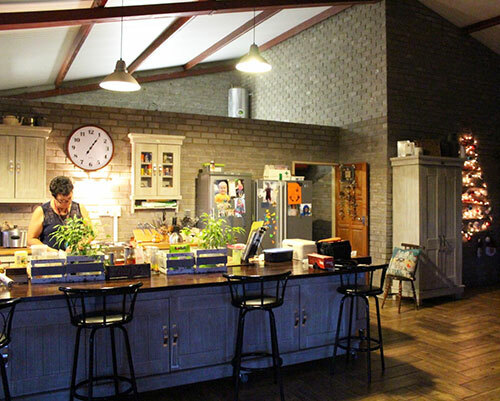 Matt, Kirsty, Todd and Digby enjoy their Milestone Kitchen in their beautiful home near Underberg. You see, best decision ever….A Milestone Kitchen. We couldn't agree more. My kitchen turned out awesome!!! It was the best choice I ever made in my life. I probably have the most beautiful kitchen in the hole of our small town. Jacqueline du Plessis - Mtunzini KZN"
We had a superb show. 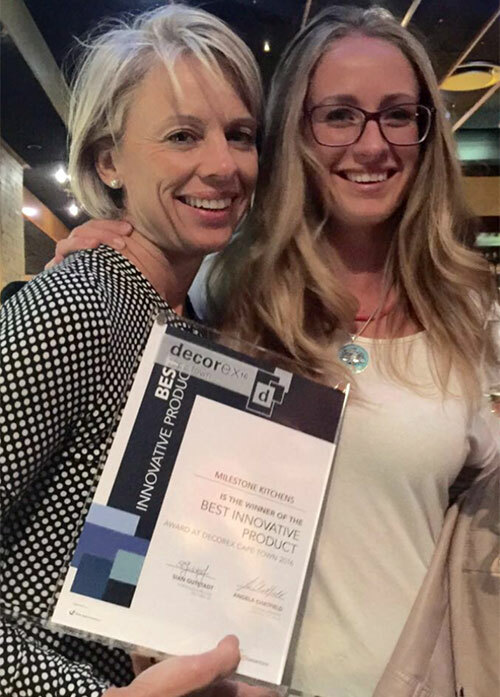 The competition was stiff and Milestone Kitchens felt honoured to be the recipient of the award for the "Best Innovative Product" at Cape Town Decorex 2016. Thank you to all those lovely, friendly Capetonians who stopped by to chat and buy our products. We appreciate your support. We completely sold out of everything. 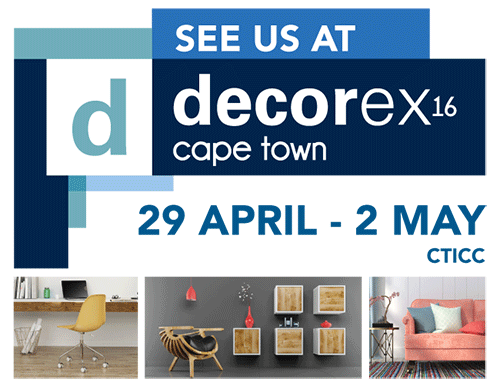 We are exhibiting at the Cape Town Decorex show starting today until 2nd May 2016 at the Cape Town International Convention Centre. 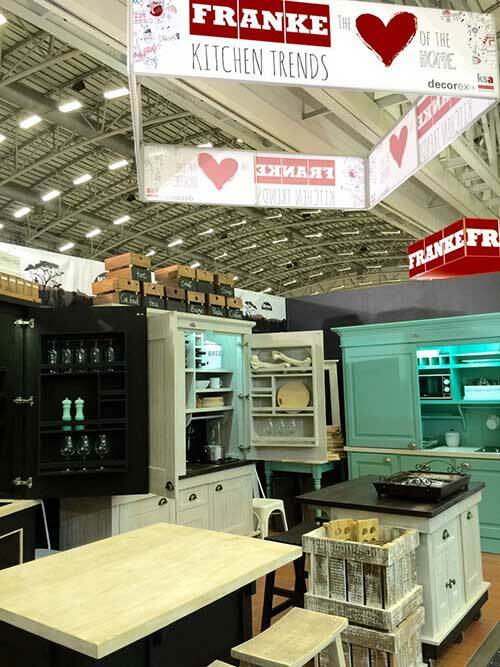 We will be launching our new Kitchen in a Cupboard and we are offering a 10% discount for all confirmed orders received for this cupboard at the show. Please note that you have to place your order at the show to qualify for the discount. 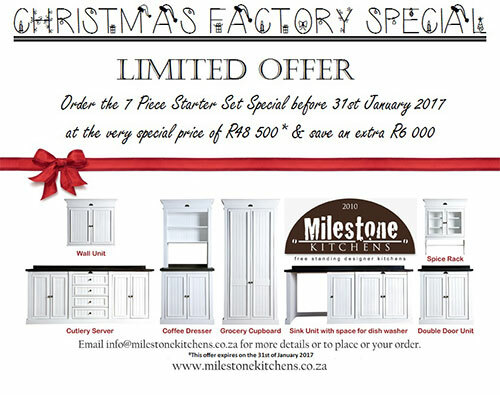 We will be selling the Milestone Kitchen in a Cupboard samples that are on display (as pictured) at the show as they are, at a 30% discount. We look forward to meeting you. 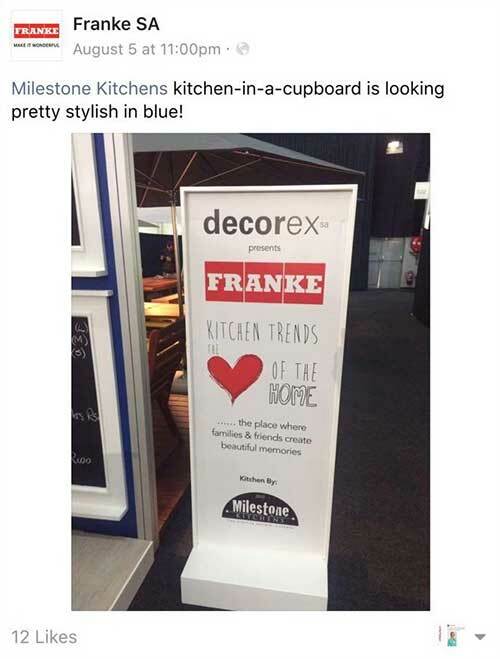 Milestone Kitchens will be exhibiting at the Cape Town Decorex show from 29 April to 2 May 2016 at the Cape Town International Convention Centre. 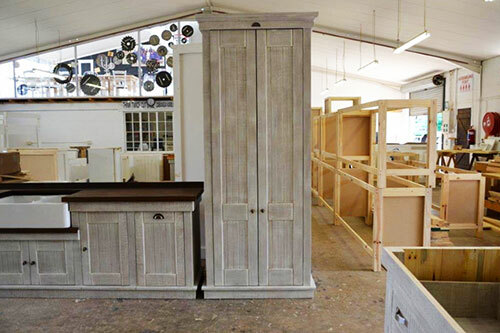 We will be launching our new Kitchen in a Cupboard and we are offering a 10% discount for all confirmed orders received for this cupboard at the show. Please note that you have to place your order at the show to qualify for the discount. 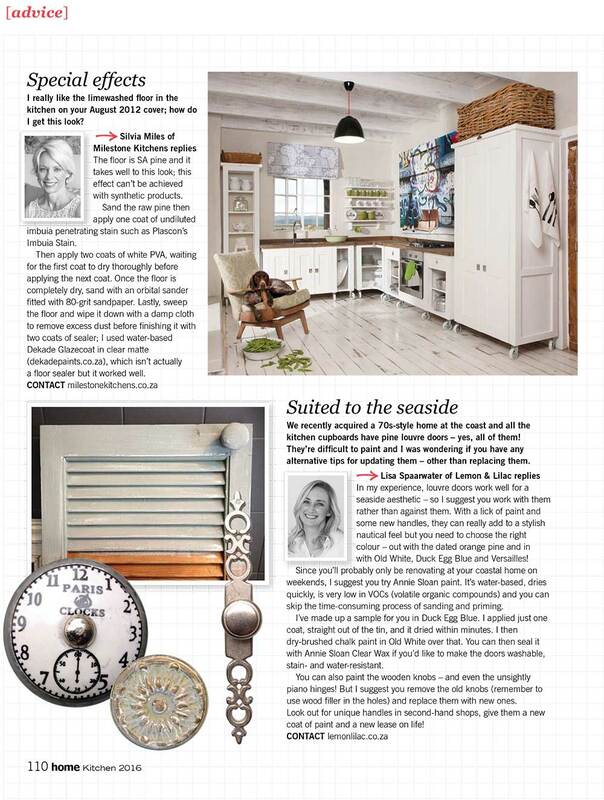 Let us know if you would like to know more about the Kitchen in a Cupboard. Below is a map of where we will be at the expo. Our new Kitchen in a Cupboard is causing quite a stir. Everybody loves it. Find it in the May issue of HOME/TUIS. Your Kitchen in a Cupboard is Flippin Fantastic ! I'm off to measure the farm house. I think I want a plain black kitchen in a cupboard. I will place my order this week. Genius... I was looking at an antique cupboard until I read the article. 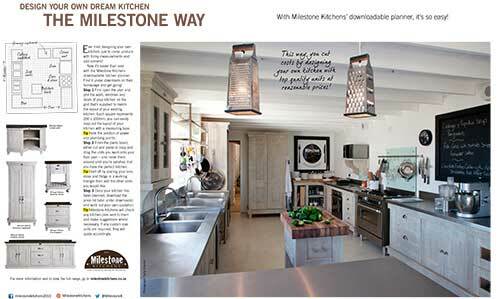 Milestone Kitchens will be exhibiting at Cape Town Decorex from 29 April to 2 May 2016 at the Cape Town ICC. 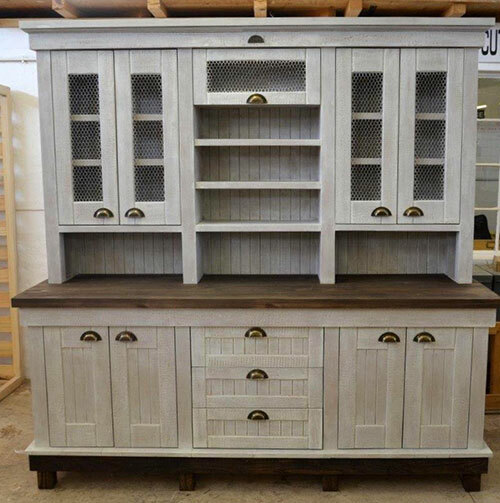 We will be launching our new Kitchen in a Cupboard and we are offering a 10% discount for all confirmed orders received for this cupboard at the show. Please note that you have to place your order at the show to qualify for the discount. 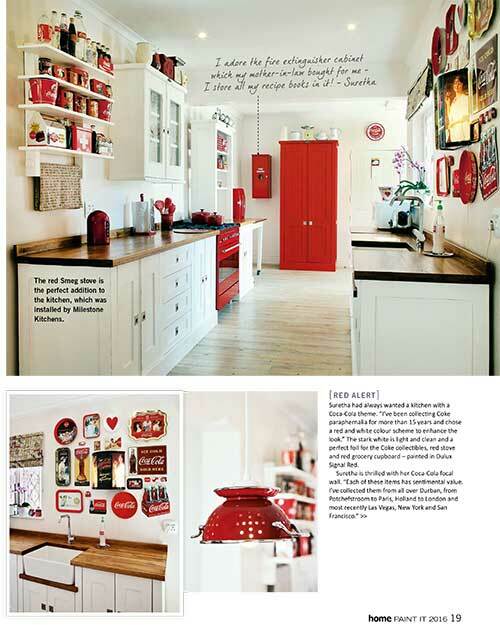 Let us know if you would like to know more about the our Kitchen in a Cupboard. 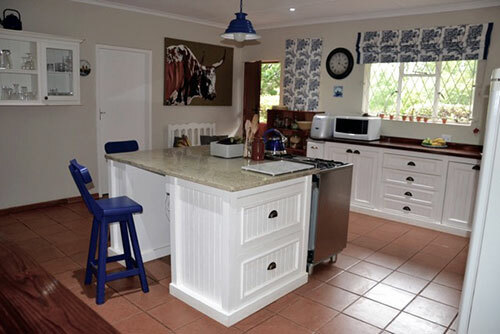 This is a kitchen in Mispah, near Greytown. 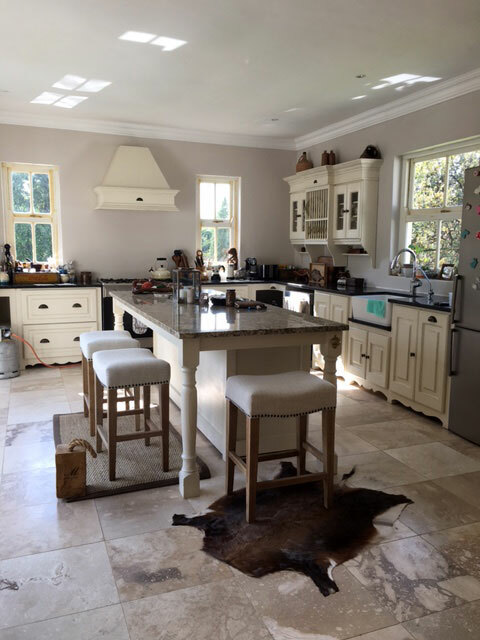 We love how cleverly our client has used the granite tops from her old kitchen to create a new island. 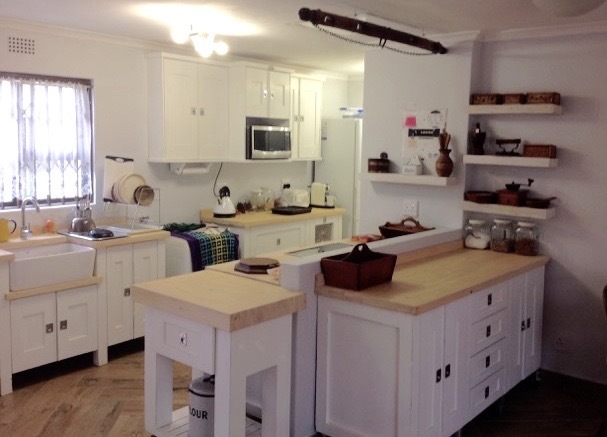 The base is 3 separate Milestone Units and the top is the granite of her the breakfast nook of the old kitchen. 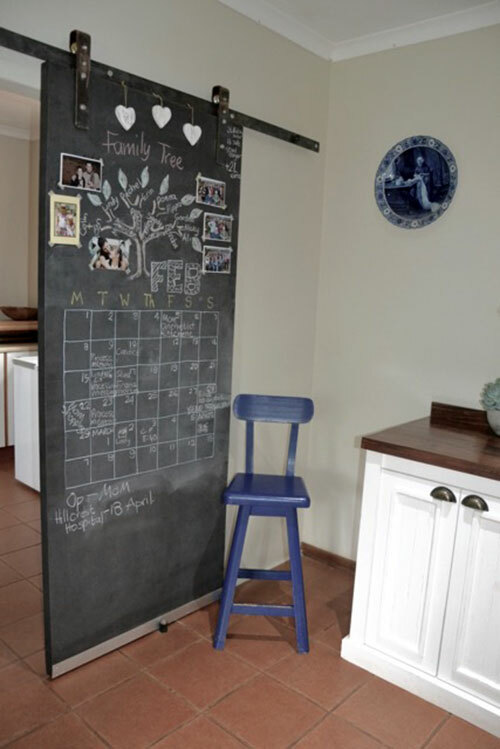 We also love the blackboard door into the pantry. Well done Helen. 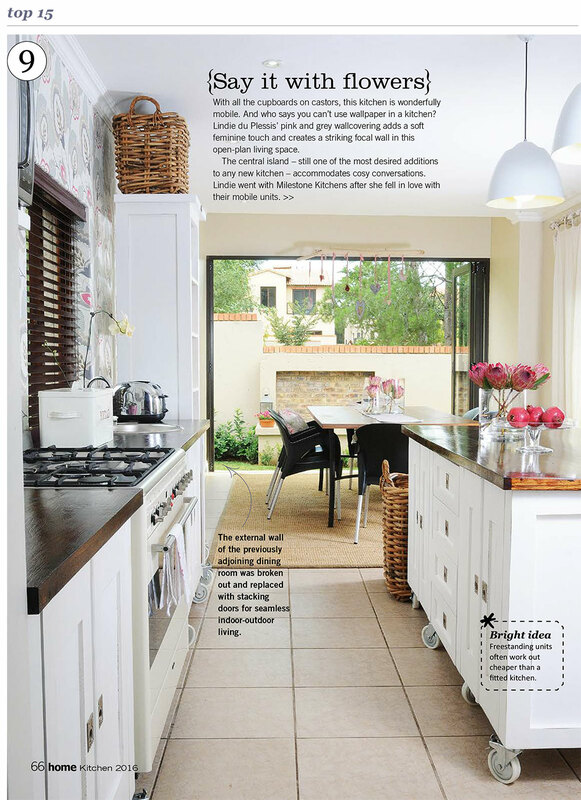 One of our favourite Kitchens in Hillcrest. In the current kitchen issue of HOME/TUIS. A beautifully sealed Dark Stained Pine Top on a Swedish Style Milestone Unit. 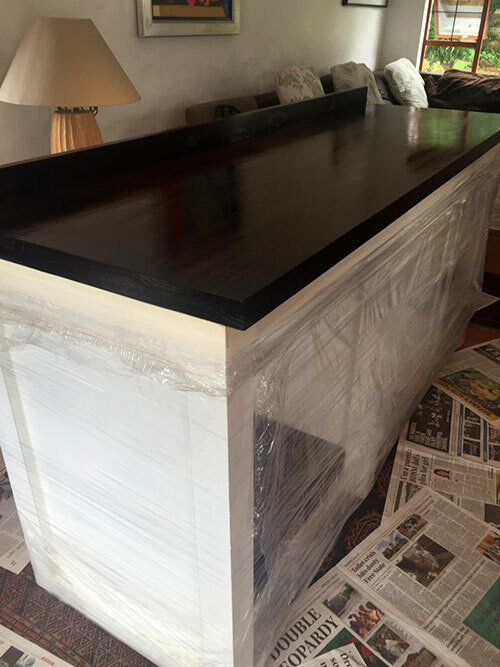 Debbie McCusker said, "We sealed our tops with Woodoc 25 matt clear sealer, 3 coats with a very fine steel wool rub down in between coats 1 and 2! We followed the instructions exactly and used a thin brush, a good quality, to minimise hair loss which is difficult to correct, on the sides and a bigger brush for the tops. The tin says don't store or clean the brushes in turpentine but you have to or they just get hard and useless! We left the tops to dry and harden for 2 days before putting anything on top of them. I lined my shelves with a sort of naffy black "rubber matting" which is breathable as it has holes in it, but this is proving to be fantastic as it prevents bumps and scratches and is kinder to the glassware and crockery." We'd like to thank our clients who take the time to write us such lovely letter. It makes us happy. I know bog standard and a touch boring compared to red and blue units. But these Milestone Units fit in perfectly with Maude Sumner and BeeZy Bailey and Jean Beeton and Bettie Celliers Barnard and Walter Battis and Marieka Prinsloo. 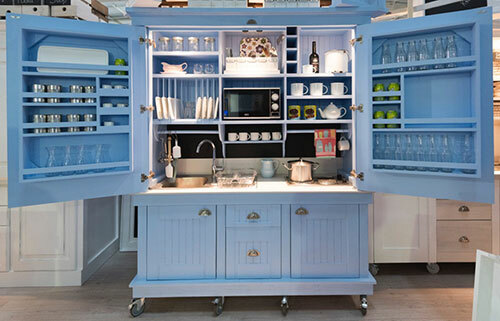 I always wanted an 'art gallery kitchen'... and these units are as good inside as on the outside... Thank you Silvia - it has been such a pleasure to work with you. I know I am going to be doing more business with you. 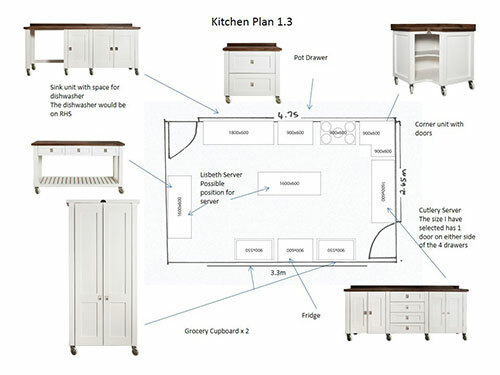 Remember to use our kitchen planner to help you plan and design your own kitchen. 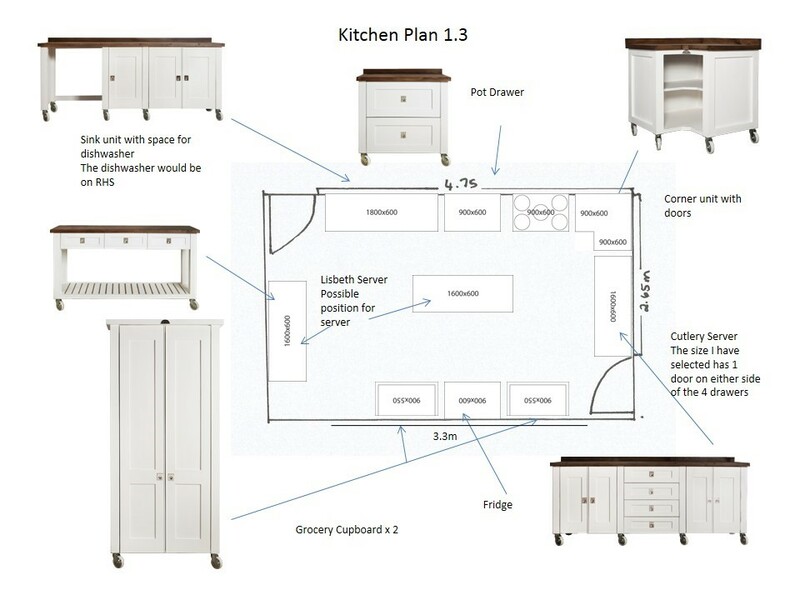 You can download our kitchen planner on from our website. We value the compliments that clients send our way but we also value helpful suggestions on how to improve. Thank you to those of you who take the trouble to point out our faults. 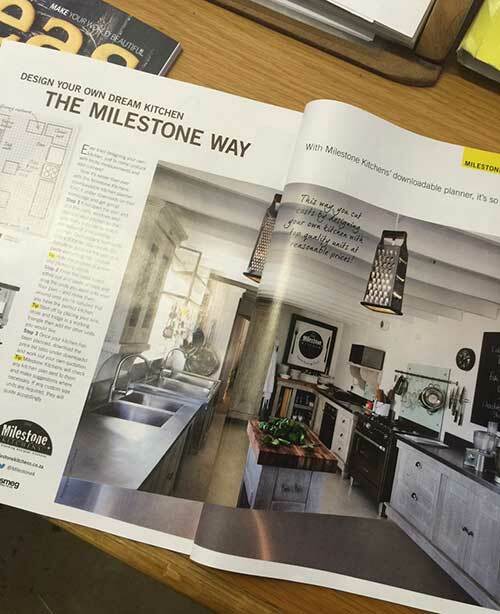 It give us an opportunity to make Milestone Kitchen Units even better than they already are. We value the constructive criticism from Glendon Menteath in his letter to us (below) and we are working on making improvements in these areas. Barbara and I have relocated to the Cape and have settled most of our possessions. 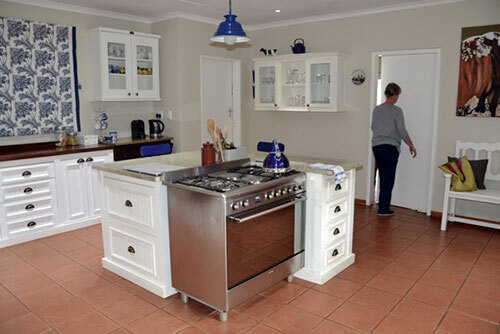 I have sent you a snap of the kitchen with all the cupboards moved in. 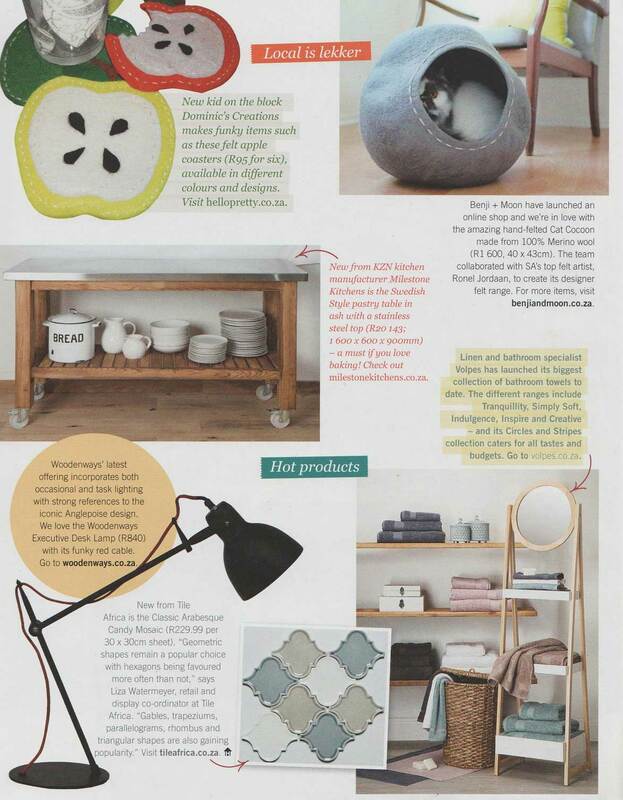 The Butchers Block is a must for any family - so versatile! We have added some shelves to the Microwave Wall Unit as we found that one can mainly store glasses and cups due to the narrowness of the shelves and there was a waste of good storage space (space is at a premium). One criticism is that many of the hinges on the doors, which take 4 screws, only had two screws. We would have expected the quality assurance team to identify this prior to shipping. Everybody is loving our new Pastry Table in Ash with Stainless Steel Top. 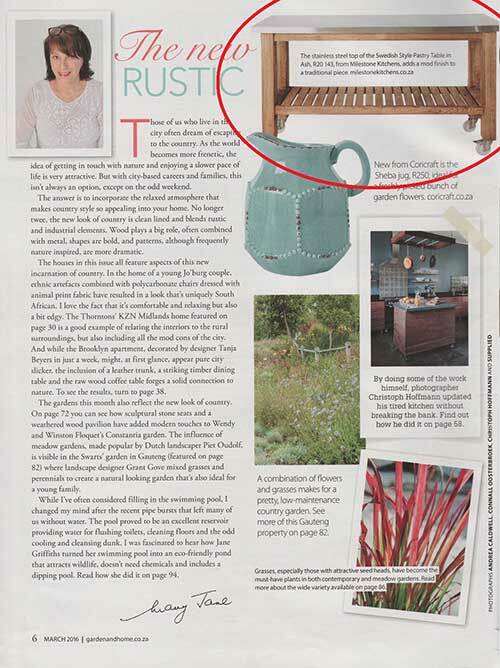 The picture below shows it is a favourite of Mary Jane Harris, editor of SA Garden and Home (March 2016). The table has also appeared simultaneously in the March issue of HOME/TUIS. We really appreciate feedback like this. 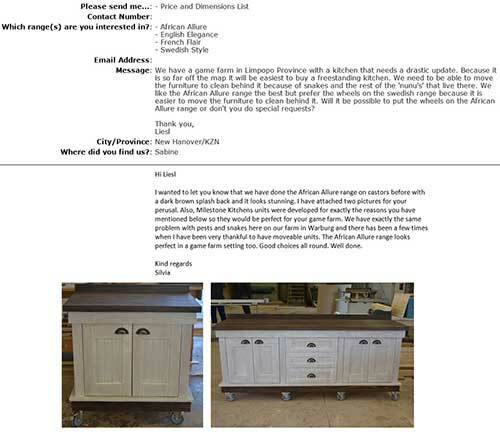 It makes all the attention to detail we put into our units and client service worth it. The old AA kitchen is in my mother's house. She's decided to plaster the open bricks and paint the house all different kinds of oranges (the Dulux Argentina range). It's a very daring move, but I think we're going to be surprised when it's all done. 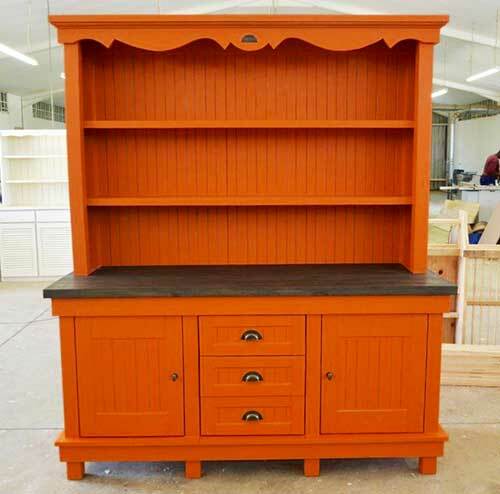 She has a very clear image in her head, and that's why she ordered the hood and the chateau dresser in the orange colour. So her kitchen will be grey and orange. I'll send pictures when the whole project is done. Christine is already searching your website, making a wishlist of all the units that she'd like to have in the future - the benches and chairs have caught her eye. So I think that she will definitely order from you guys again. 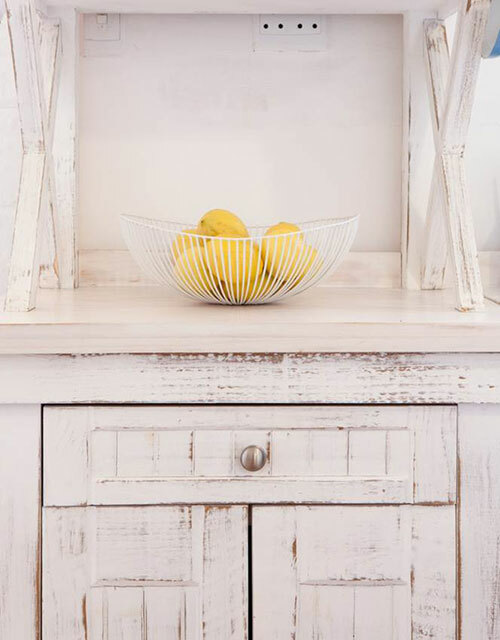 As for me, I'm waiting for my house to be completed, and then I have a load of cement and concrete work planned in the scullery and kitchen to compliment the swedish style units; ultimately I want to reach an industrial-scandinavian style in my home. So depending on how that goes (and a lot of DIY!!) 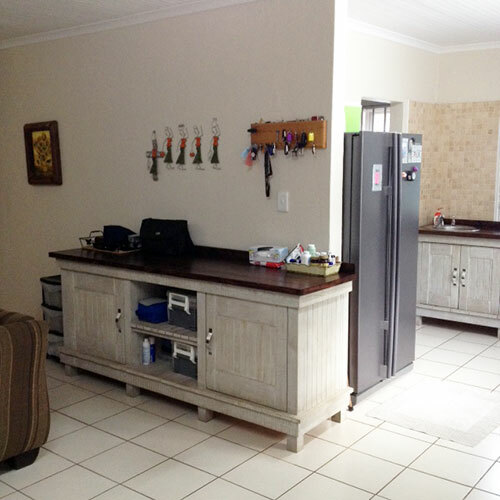 and how much space is left in my kitchen, I'm hoping to also order more units from you. 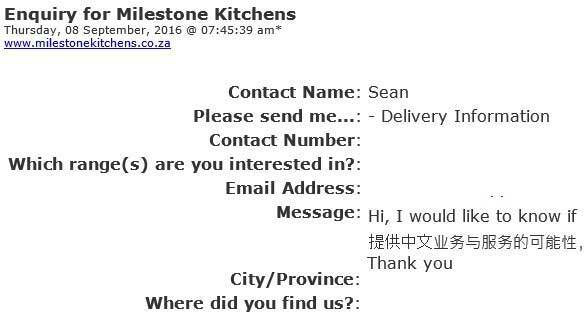 So we'll be in contact as I send pictures of our kitchens. Again, thank you, we're all big fans and so very fortunate to have your units in our kitchens. 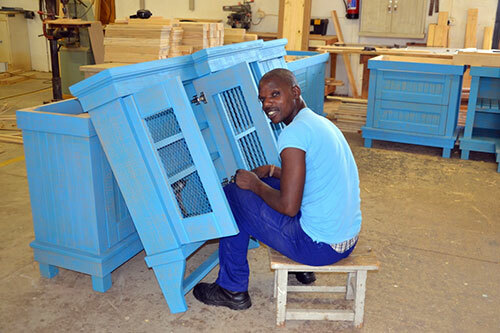 At Milestone Kitchens, carpenters like to wear the same colour as the furniture they make! Or maybe it's because this blue is particularly beautiful? We love this shelf unit we made for a client’s stationary shop. It is Swedish Style with no doors. There are so many options for displaying stationary. African Allure Coffee Dresser with French Flair Twirl in 'Dulux Daring Argentina'. What do you think? Please go to our Facebook page and give us your opinion. We love to know what our followers think. 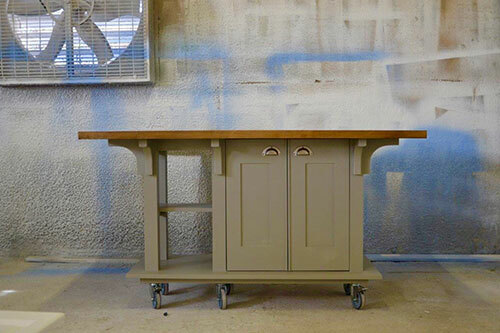 If anyone has a small kitchen that they would like to refurbish look no further. 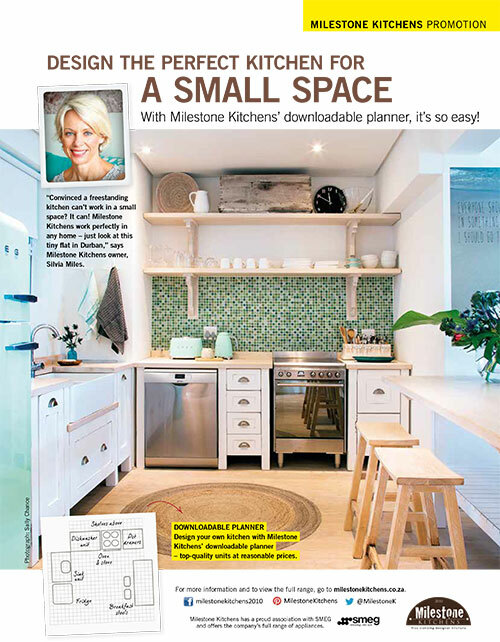 Milestone Kitchens units are ideal for small spaces. 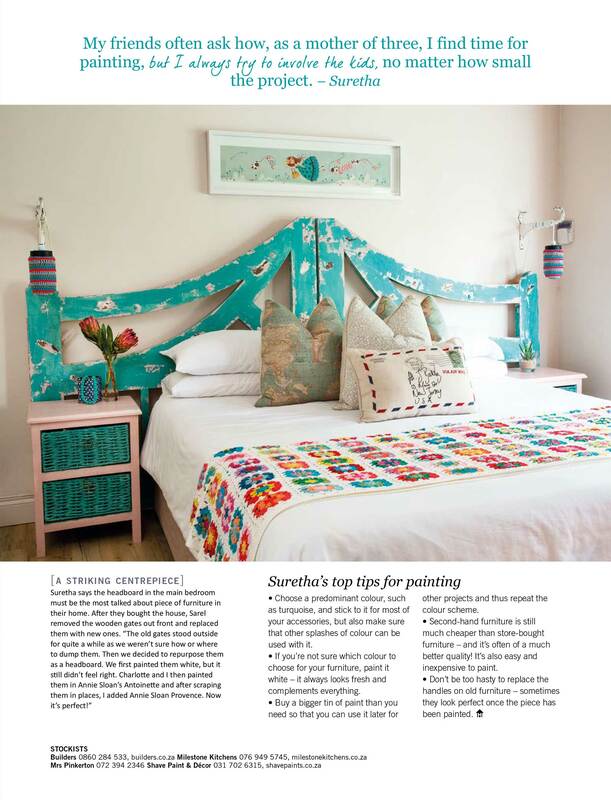 Look out for our Double Page Spread in the Feb issue of HOME/TUIS. It is causing quite a stir on the home front. We have had many requests for our unique stainless steel tops and innovative “grater lights”. We have also had many questions on how to use our Kitchen Planner. Please Contact Us should you need any information on the above. We look forward to hearing for you. 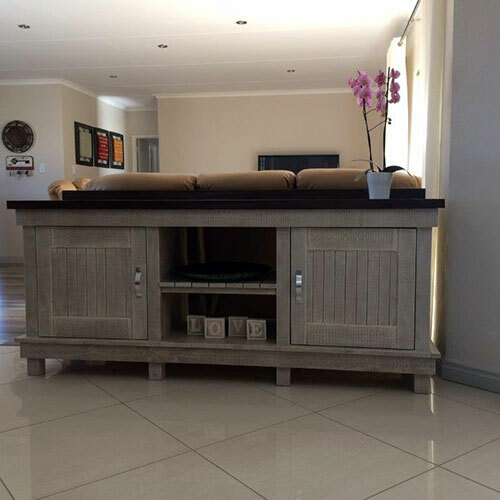 We love this custom made African Allure Coffee Dresser that we made for a client in Ermelo. Joshua Meyer designed it himself and with a little help from us... this is the result. We have news from Botswana! It is always good to hear from past clients, particularity if they live in Botswana. Liza lives in Ghanzi, Botswana, a very dry and hot part of the world. She ordered her Milestone Kitchen a few years ago. 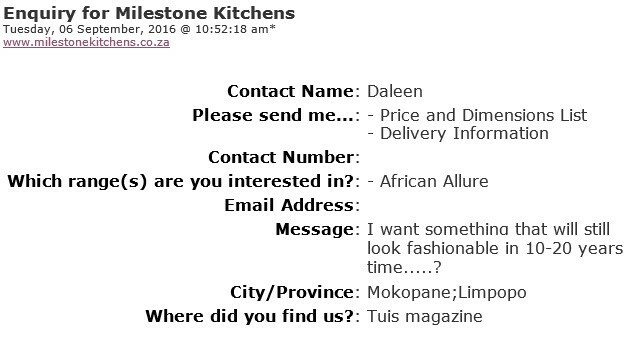 If you are from Botswana and would like to order a Milestone Kitchen, read below. The Island and all the other pieces are really out-performing themselves.... we sealed all the tops with a permeable sealant and we oil them every 2nd or 3rd week, and there are no cracks at all. The haven't dried up, gone askew or curled up. None of that. They look brand new like the day they arrived here. I'll take some pictures and send them to you next week. We are VERY happy with the Kitchen. 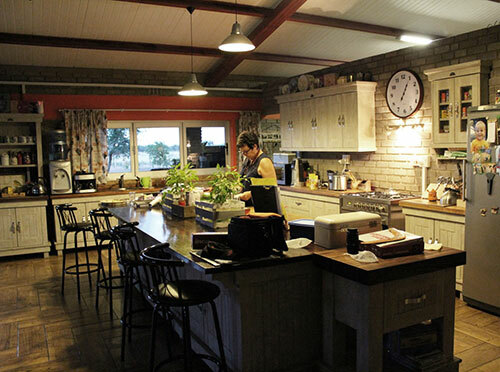 I've been living with my parents in the farm house, so we've been sharing the kitchen. But now I'm getting married and will be moving into a new house which my fiance and I are building. We should be moving in around March. Which is why I want to order a new kitchen for my new home! Very excited. My sister-in-law has contacted you already for her kitchen, because they too will be moving into a newly built house here on the farm in the new year. She asked me to help, so I'm going to place both our orders together, then we can share transport costs etc. So we'll be having 3 families in 3 farm houses with 3 unique Milestone Kitchens. Sounds perfect. Looking forward to working with you again, always a pleasant experience. 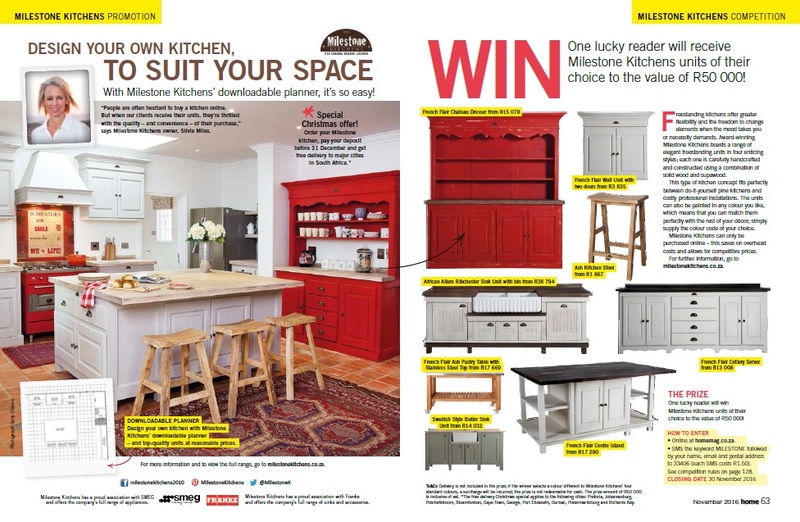 This is our TMK Factory kitchen, in the latest issue of HOME/TUIS. The one we work in to provide our restaurant patrons with their delicious meals. Much fun and laughter has been had in this kitchen. Some tense moment too though. And it doesn’t always look so clean and tidy. But it’s always a pleasure to work in. Great news is that we have decided to extend our popular 7 Piece Starter Set Special to all our ranges until the end of January. "This is such an amazing email! You have definitely made me love Milestone even more than I already do!..."